Please do not rake your yard waste into the street. We are not running the leaf machine this spring. Yard waste must be bagged in brown paper recycle bags and put out for pick up. As always, thank you for your cooperation. 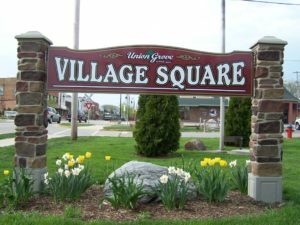 If you have any questions or concerns, you can reach the Village offices at 262-878-1818. For the latest information on programs and events, view the events calendar. The Public Is Invited To Attend Village Meetings. New Stray Dog & Cat Information. For information on awareness, prevention and removal of ticks, view the tick information PDF. Tax payment refunds will go out once a week. If a refund is less than $2.00 we will not be issuing a check, if you want the refund you will need to request it in writing and return in two weeks to pick it up. Trees will soon be dropping their leaves. Remember that leaves should be placed in the roadway for pick up by the Village. Do not place branches, garden waste or other items with the leaves. As winter approaches, residents are remined that snow and ice must be cleared from sidewalks in front of your property within 24 hours after the end of the snowfall. If not cleared, the Village will clear the sidewalk and the property owner will be charged for the cost. Please remember that you are not to push, plow or throw the snow into the street where it will cause problems for traffic. All residential roof drains shall be discharged no closer than six feet from any lot line and above grade. Roof drains that are installed to discharge below grade shall be removed and shall be so reconstructed as to discharge above the ground level grade. Residents should check their roof drains and make sure that they discharge onto the ground and not into the sanitary sewer. From November 15 through March 15, overnight parking shall be permitted only on the even-numbered side of the street on the nights bearing an even calendar date during the hours from 2:00 a.m. to 6:00 a.m. and on the odd-numbered side of the street on those nights bearing an odd calendar date during the hours from 2:00 a.m. to 6:00 a.m. on any street in the village, except Main Street. No person shall permit any motor vehicle owned by him or under his control to remain standing or parked in any village street or a village-owned or -operated parking lot in excess of 24 consecutive hours.